In accordance with Directive 2004/49/EC, common safety targets (CSTs) and common safety methods (CSMs) should be gradually introduced to ensure that a high level of safety is maintained and, when and where necessary and reasonably practicable, improved. Pursuant to Article 6(1) of Directive 2004/49/EC, the European Commission should adopt CSMs. These should describe, amongst others and in accordance with Article 6(3) of Directive 2004/49/EC, how the safety level and achievement of CSTs are assessed. In order to ensure that the current safety performance of the railway system is not reduced in any Member State, the first set of CSTs should be introduced. It should be based on an examination of existing targets and safety performance of railway systems in the Member States. Furthermore, in order to maintain the current safety performance of the railway system, a harmonisation, in terms of risk acceptance criteria, of safety levels for the whole national railway systems is necessary. The compliance with safety levels should be monitored in the different Member States. In order to establish the first set of CSTs in compliance with Article 7(3) of Directive 2004/49/EC, it is necessary to quantitatively identify the current safety performance of railway systems in Member States by means of national reference values (NRVs), to be calculated and utilised by the European Railway Agency (the Agency) and the Commission. These NRVs should be calculated only in 2009, with a view to developing the first set of CSTs, and in 2011, with a view to developing the second set of CSTs. In order to ensure consistency of the NRVs and to avoid undue burden, light rail systems, functionally separate networks, privately owned railway infrastructures solely used by the owner, heritage, museum and tourist railways should be exempted from this Decision. Due to the lack of harmonised and reliable data on safety performance of parts of the railway system referred to in Article 7(4) of Directive 2004/49/EC, it has been ascertained that the development of the first set of CSTs, expressed in risk acceptance criteria for specified categories of individuals and for society as a whole, is at the moment feasible only for the railway system in its entirety and not for its parts. Following the progressive harmonisation of national statistical data on accidents and related consequences, in compliance with Regulation (EC) No 91/2003 of the European Parliament and of the Council of 16 December 2002 on rail transport statistics (2) and Directive 2004/49/EC, the development of common methods for monitoring and targeting safety performance of railway systems in Member States should take account of statistical uncertainties and the need for an element of judgement in deciding whether a Member State’s safety performance is maintained. To allow a fair and transparent comparison of railway safety performance amongst Member States, Member States should perform their own assessments on the basis of a common approach for identifying the safety targets of the railway system and for demonstrating compliance with them. This Decision establishes a common safety method to be used by the European Railway Agency (hereafter ‘the Agency’) for calculating and assessing the achievement of common safety targets (CSTs), in application of Article 6(1) of Directive 2004/49/EC. heritage, museum and tourist railways that operate on their own network, including workshops, vehicles and staff. For the purposes of this Decision, definitions of Directive 2004/49/EC and Regulation (EC) No 91/2003 shall apply. ‘track-km’ means the length measured in kilometres of the railway network in Member States where each track of a multiple track railway line is to be counted. 1. The methodology described in the Annex shall apply for calculating and assessing the achievements of NRVs and CSTs. 2. The Agency shall propose to the Commission NRVs calculated in accordance with section 2.1 of the Annex and CSTs derived from the NRVs, in accordance with the methodology set out in section 2.2 of the Annex. After adoption of NRVs and CSTs by the Commission, the Agency shall assess their achievement by Member States in compliance with chapter 3 of the Annex. 3. The assessment of the estimated costs and benefits of CSTs referred to in Article 7(3) of Directive 2004/49/EC shall be limited to those Member States whose NRVs, for any of the risk categories, are found to be higher than the corresponding CSTs. in case of ‘probable deterioration of safety performance’: the Member State/s concerned shall send to the Commission a report explaining the likely causes of the results obtained and submit, if appropriate, a safety enhancement plan. In order to evaluate any information and evidences provided by Member States in accordance with the process referred to in points (a) and (b), the Commission may ask the Agency to provide technical opinions. Done at Brussels, 5 June 2009. (1) OJ L 164, 30.4.2004, p. 44; corrected by OJ L 220, 21.6.2004, p. 16. (2) OJ L 14, 21.1.2003, p. 1. The NRVs and the CSTs shall be calculated on the basis of data on railway accidents and related consequences, reported according to Annex H to Regulation (EC) No 91/2003 and according to provisions of Articles 5, 18 and Annex I to Directive 2004/49/EC. Within the framework of determining the first set of CSTs, in case of inconsistencies between data coming from the two sources referred to in point 1.1.1, data reported according to Annex H to Regulation (EC) No 91/2003 shall have precedence. The time series of data which will be used for attributing values to NRVs and CSTs shall include the four most recent reported years. No later than 31 January 2011 the Agency shall propose to the Commission the adoption of updated values for NRVs and CSTs, calculated from data for the six most recent reported years. The measurement units for NRVs shall be expressed in compliance with the mathematical definition of risk. The consequences of accidents which shall be considered for each of the risk categories are the FWSIs. The measurement units which shall be used for quantifying NRVs for each of the risk categories are laid down in Appendix 1 and result from the application of the principles and definitions referred to in point 1.2.1 and, where relevant, point 1.2.3. The measurement units include the scaling bases listed in Appendix 1, for the normalisation of NRVs. For each of the risk categories ‘passengers’ and ‘level crossing users’ two different NRVs shall be set, expressed with the two different measurement units referred to in Appendix 1. For the purposes of the assessment of achievement referred to in chapter 3, compliance with at least one of these NRVs shall be considered sufficient. The measurement units to be used for quantifying CSTs for each of the risk categories shall be the same as the ones described for NRVs in section 1.2.
if the zero values referred to in point (b) are more than two, the Agency shall attribute to the NRV a discretional value to be identified by consulting the Member State concerned. the value equal to 10 times the European average value of the risk to which the considered NRV refers. The European average referred to in point 2.2.1(b) shall be calculated by cumulating the relevant data for all the Member States and by using the corresponding measurement units listed in Appendix 1, as well as the weighted average described in section 2.3.
for each Member State and for each of the risk categories whose respective NRV is higher than the corresponding CST, the CST shall represent the maximum tolerable level of the risk to which it refers. The assessment of achievement of the CST shall be carried out in compliance with the requirements deriving from the impact assessment and, where applicable, the timetable for gradual implementation of the CST, according to Article 7(3) of Directive 2004/49/EC. For each Member State, and for each of the risk categories, the assessment of achievement of the NRV and CST shall be carried out annually by the Agency, taking into consideration the most recent four preceding reported years. No later than 31 March each year the Agency shall report to the Commission on the overall results of the assessment of achievement of NRVs and CSTs. Taking into account the provisions laid down in point 1.1.3, from 2012 onwards the assessment of achievement of the NRVs and CSTs shall be carried out annually by the Agency taking into consideration the most recent five preceding reported years. probable deterioration of safety performance. The procedure for the assessment of achievement of NRVs is composed of four different steps as described in the following points. 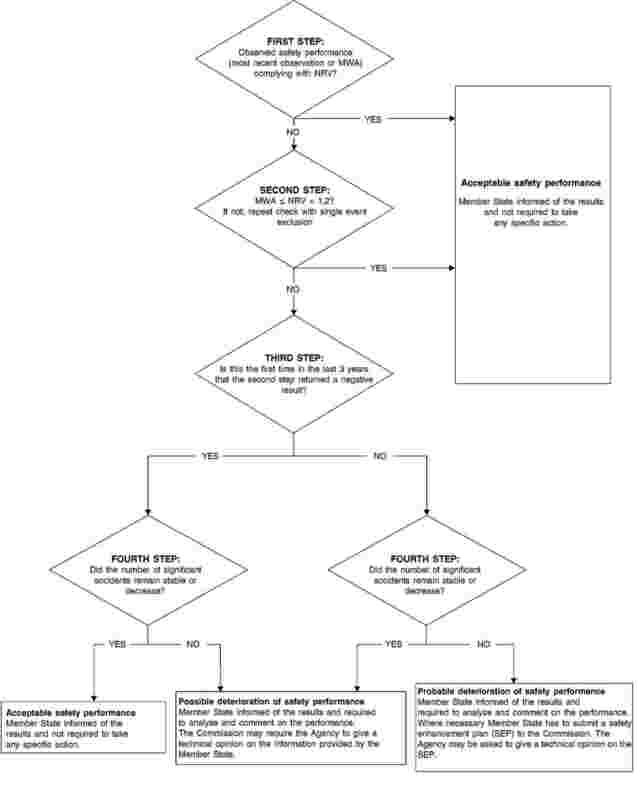 The overall decisional flowchart of the procedure is shown in Appendix 2, where positive and negative decisional arrows correspond respectively to a ‘passed’ and a ‘failed’ result of the different assessment steps. moving weighted average (MWA), as specified in section 3.3. The values returned by applying points (a) and (b) shall then be compared with the NRV, and if one of these values does not exceed the NRV the safety performance shall be considered acceptable. If this is not the case, the procedure shall continue with the second assessment step. The second assessment step shall consider the safety performance as acceptable if the MWA does not exceed the NRV plus a 20 % range of tolerance. If this condition is not satisfied, the Agency shall ask the safety authority of the Member State concerned to provide the specifics of the single highest-consequence accident (in terms of FWSIs) in the most recent years of observation as referred to in section 3.1, excluding the years used to set the NRV. If this single accident is more severe, in terms of consequences, than the most severe single accident included in the data used for setting the NRV, it shall be excluded from the statistics. The MWA is then recalculated to check whether it lies within the abovementioned range of tolerance. If this is the case, the safety performance shall be considered acceptable. If this is not the case, the procedure shall continue with the third assessment step. The third assessment step shall verify whether it is the first time in the last 3 years that the second assessment step did not return evidence of acceptable safety performance. If this is the case, the outcome of the third assessment step shall be classified as ‘passed’. The procedure shall continue with the fourth step, whatever the outcome of the third step may be. The fourth assessment step shall verify whether the number of significant accidents per train-km, with respect to the previous years, remained stable (or decreased). The criteria for this appraisal shall be whether there has been a statistically significant increase in the number of relevant significant accidents per train-km. This shall be evaluated by using an upper Poisson tolerance bound which will determine the acceptable variability based on the number of accidents that occurred in the different Member States. If the number of significant accidents per train-km does not exceed the abovementioned tolerance bound, it is assumed that there has not been a statistically significant increase, and the outcome of this assessment step shall be classified as ‘passed’. risk to society as a whole: all significant accidents.